“East is East and West is West and never the twain shall meet”. While I don’t necessarily agree with that sentiment I have to admit that there is a cultural divide between the East and West Kootenays. To quote the great British acoustic guitarist, Martin Simpson, “You can leave Cranbrook in September 1998 and two hours later arrive in Nelson in 1968”. There is definitely some truth in that. Nelson and the West Kootenays do have a decidedly counter culture flavour while the Cranbrook-Kimberley area and the East Kootenays tends to be more main stream, maybe even a little red-neck. So it comes as no surprise to hear that Selkirk College in Nelson now has a program in Northern Indian Classical Music. It is a long way from Benares on the banks of the Ganges to Nelson on the banks of the Kootenay River. Never-the-less the Mishra family of Indian Classical Musicians manages to schedule a month each year in Nelson to run the Indian music program. 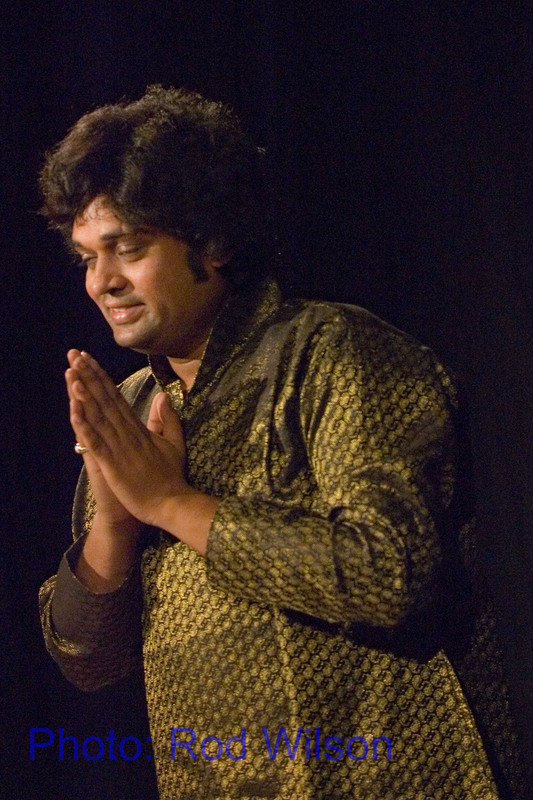 This year, as part of the program, the sitarist Pandit Deobrat Mishra and his nephew, the tabla player Prashant Mishra performed concerts in Nelson and Kimberley. Since the Beatles infused the song “Norwegian Wood” with the melodic motif played on the sitar the sound of the instrument is familiar to most western audiences. That does not mean that western audiences are knowledgeable about Classical Indian Music. Outside of esoteric musical circles most audiences would not be familiar with the traditional instruments and forms of the music. 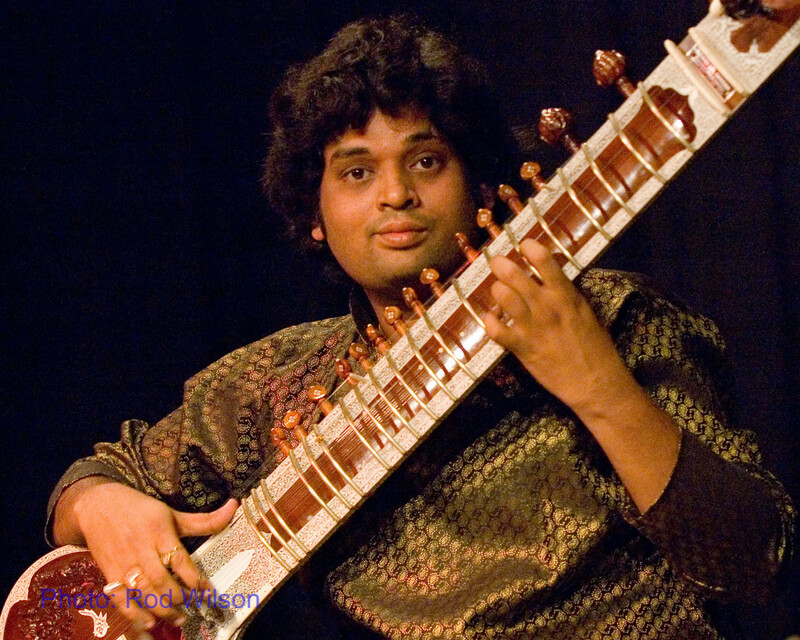 On records and on film scores the sitar usually shows up as an exotic atmospheric instrument. No knowledge of the music is required. On the other hand, the hand drums, the Tablas, are far more ubiquitous. Western drummers and percussionists, particularly studio musicians, have taken to instrument. On any given day, on any given film score the tablas will be heard tick-tocking away with their very identifiable percussive sounds that often have no link to any foreign or exotic content in the movie. Northern Indian Classical music as played by the Mishras is very different from its southern Indian counterpart. Deobrat is very familiar with the blending of various musical traditions that flows from the musical encounters of Zakir Hussain, John McLaughlin, Carlos Santana, Shakti and numerous eastern and western musicians over the past twenty years. The Mishras goal is to continue to expose western audiences to Indian music, participate in the blending of Northern and Southern Indian musical traditions and explore a number of “third world” musical options. The concert at Centre 64 in Kimberley was an opportunity for the Mishras to share their culture and in a very low keyed way instruct an audience in the music. Traditional Indian compositions, or Ragas, tend to be long and in more traditional settings a single performance can last several hours. For the first half of Saturday night’s performance Deobrat chose a 45 minute rendition of the traditional evening Raga Jog. The format of the performance, as is usual, consisted of three connected improvisations (Alaap, Jor & Jhalla) that flowed freely from a very meditative melodic state to ones of increasing intensity until the it was time to play the Gat (the actual composed raga). 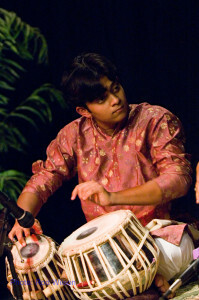 It was during the playing of the Gat that Prashant on Tablas came into his own. From then on, until the final climatic conclusion, there was what can only be described as, musical conversations and dialogue between the Sitar and the Tablas. In jazz parlance it would be described as “call and response” or “trading fours”. In Indian music there is no place for western harmony. The only harmony, if it can be described that way, consists of drones and the sympathetic vibrations from the non fretted strings. The basis of Indian music is melodic and rhythmic and there is no doubt that the melodic and rhythmic content of the music can be very sophisticated. Yet in Saturday’s performance it was easy to put aside any notions of technical sophistication and just sit back and soak up the joyous sounds that filled the hall. After the intermission Deobrat indulged in some light banter with the audience while playing a snippet of “Norwegian Wood” and a number of more folkloric compositions such as “Mountain Song” and his father’s composition “Dream”. For an encore Deobrat sang and played a song that told the story of Krishna’s girlfriend who was a little perturbed when he dallied with 10,000 other young ladies. The evening concluded with the audience participating in some traditional Kirtan chanting. This wonderful concert of music was filled with humor and joy. When the Mishras return to this area next year it will be for a concert that I will not miss. 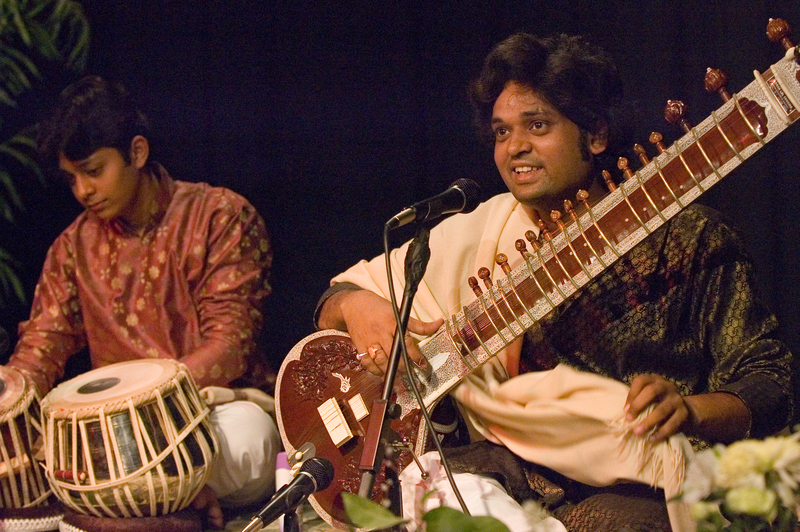 to announce a sitar/tabla concert of Deobrat and Prashant Mishra in Munich, Germany, I would like to use the above photo you took in the year 2010 at Center 64. Do you agree with my request. By all means use the photos.